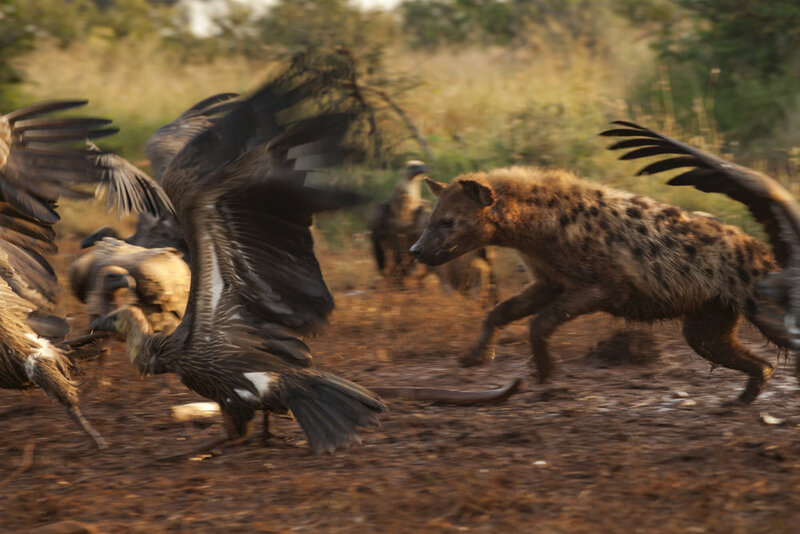 In healthy savanna ecosystems, like Kenya, vultures live in symbiosis with large mammal scavengers, especially spotted hyenas. In the night, hyenas arrive to tear open the carcass, usually first through the belly, and feed until they are satiated. At dawn, vultures arrive, each species with its own specialty: white-backed vultures aim for softer tissues, while lappet-faced vultures specialize in the sinewy tendons. Together, this scavenger guild quickly and efficiently removes carcasses from the landscape before they can spread disease like anthrax or brucellosis. Some of the photos below show this interaction at an elephant carcass in Laikipia, Kenya; the elephant was sadly killed by the Kenya Wildlife Service on suspicion of killing a man from a nearby community. In Africa and beyond, vultures are declining due to poisoning, scarce food resources, and poaching. 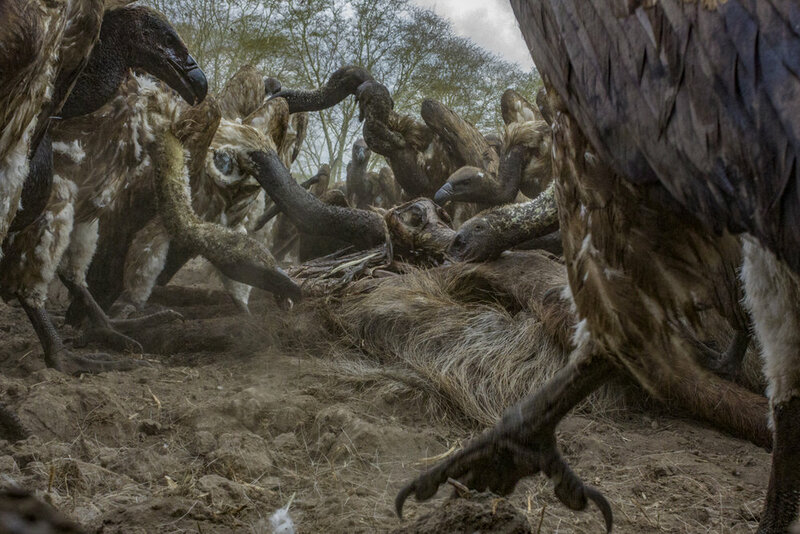 But in Gorongosa National Park, Mozambique, vultures are thriving. Gorongosa may have the largest population of white-headed vultures in Africa and the southern-most population of lappet-faced vultures, as well as a healthy population of white-backed, hooded, and palm-nut vultures. All five species are endangered. In Gorongosa, unlike elsewhere, poisoning hasn’t yet become a threat. However, fifteen years of civil war in Mozambique (1975-1992) decimated the park’s large mammal populations. 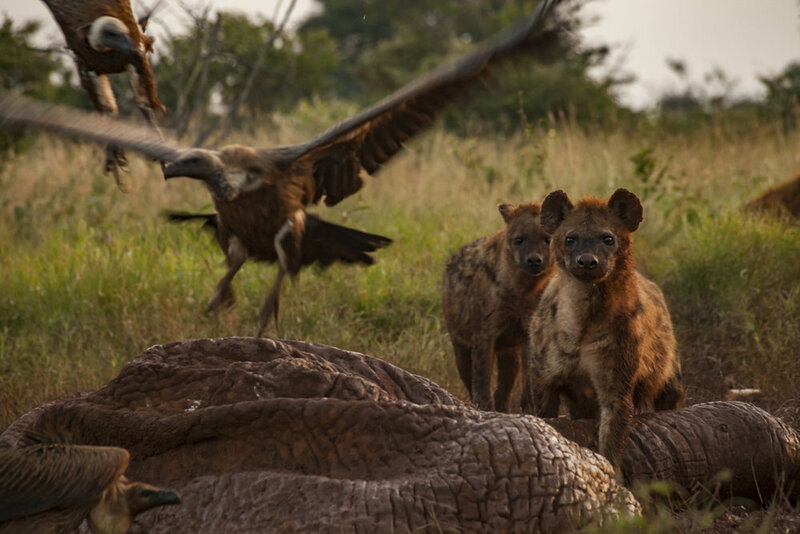 Though the numbers of large herbivores are steadily increasing, there remains one species whose absence is of particular relevance to the vultures: spotted hyenas. Without hyenas, this synergy breaks down. Though vultures have extremely sharp beaks, they are not strong enough to tear into large, tough carcasses, like waterbuck, buffalo, or elephants, without the help of hyenas. 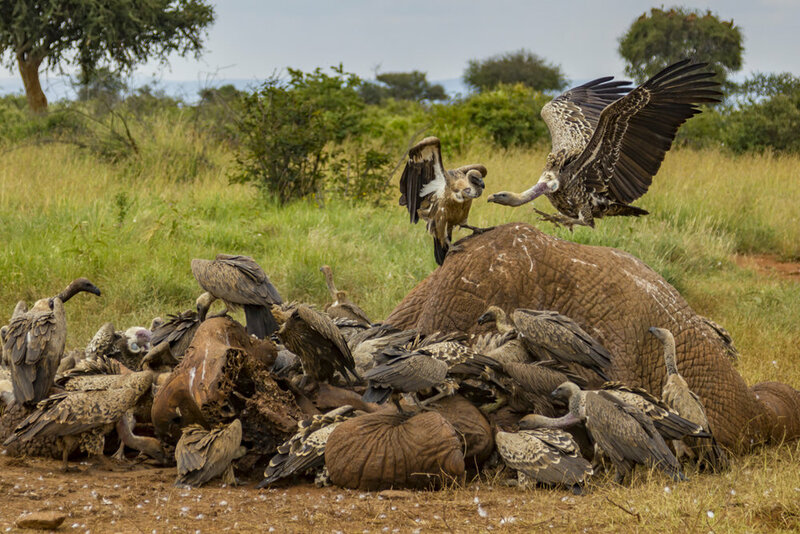 In Gorongosa, carcasses often linger, left to rot for days or weeks until the skin is soft enough for the vultures to access the meat inside. Scientists from Boise State University, the Endangered Wildlife Trust/IUCN Specialist Group, and Gorongosa National Park are studying this phenomenon. Firstly, they are monitoring Gorongosa’s vulture populations to see if the lack of access to these carcasses is affecting them. Though their numbers are strong, the scientists are finding that many of these vultures are small for their age and underweight. 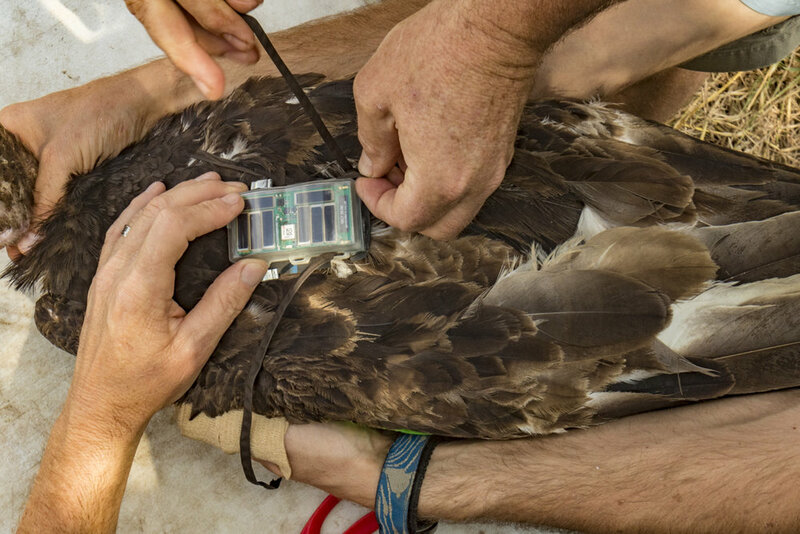 The scientists also fit the birds with GPS trackers to see how far they must range to find food. Finally, they are undertaking an experiment to see just how long it takes for vultures to clean up a carcass in the absence of hyenas: they place camera traps on found, fresh carcasses, leaving some of them closed and opening others at the belly as a hyena would. 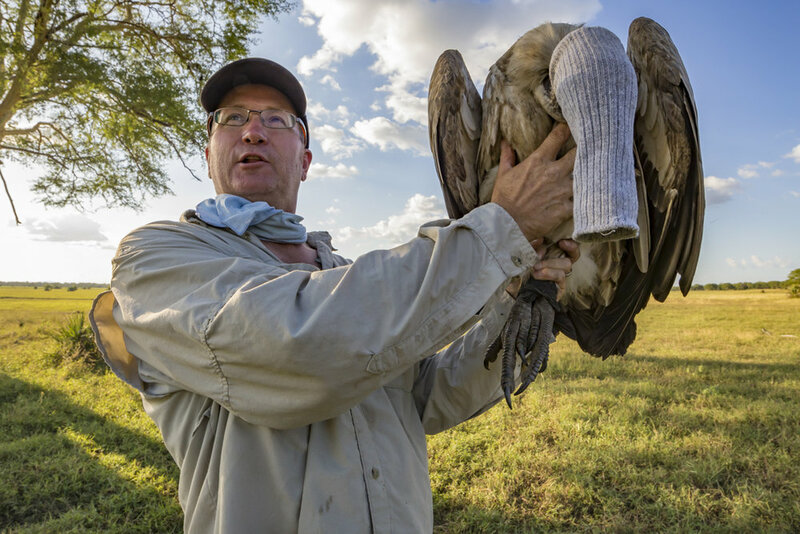 Though the study is still underway, they have found that it takes vultures more than a week to clean a closed waterbuck carcass (~500 lb), and many parts, like skin and tendons, dry out and remain on the landscape for much longer; but when the carcass has been opened, vultures can clean it up completely in about 24 hours.